Jane and I spent the morning working at our house listed for sale. We pruned and cleaned up dead plant debris from the winter. It was a nice day, so Jane agreed to accompany me on an afternoon fishing trip. My intention was to drive to the South Platte River at Nighthawk, but Jane suggested going somewhere closer due to our late start. I decided to go to Bear Creek west of Morrison and give that a try. As it was perhaps the nicest day of the spring so far, everyone was out. Morrison was packed with traffic and every pullout along the canyon was occupied with cars. People were running and biking and walking dogs and sun bathing. The parking lot at O’Fallon Park was completely occupied, so Jane and I did a U turn and continued west a bit and then turned on a side road that leads to Falcon Park and parked across the bridge. I carried Jane’s chair to a nice spot by the stream and began putting on my waders. By now some clouds moved in and the wind began to gust. Jane moved to a spot against some shrubs, while I waded in at the tail of the nice long pool below the bridge. I tied on a Charlie Boy tan hopper and trailed a beadhead hares ear nymph. I spotted a rise above a rock upstream and carefully approached. In the tail of the pool I received a pair of refusals to the hopper, so I clipped both flies off and tied on an olive body deerhair caddis. This fly worked as I hooked and landed a small 8” brown and another brown too small to count. I could spot additional fish in the pool, but they weren’t paying any attention to the caddis. Another fisherman had arrived and was fishing the riffles right below the bridge, and he was 20-30 yards above me, so I needed to focus on the nice pool longer before moving on. The Chernobyl Ant was my star attractor fly in 2011, so why not give it a try in 2011? I tied on a Chernobyl Ant and trailed the beadhead hares ear. This worked and I landed a larger (10”) brown that snatched the trailing hares ear. I was across from Jane when I experienced this small success. The other fisherman worked his way past me moving downstream and showed me the chewed up woolly bugger he allegedly caught 12 inch browns on in the riffles below the bridge. I wanted to try the GO2 caddis with a bright shiny green body that I’d discovered at the fly fishing show, so I returned to the car and added a couple to my fly patch. I returned to the stream above the bridge and replaced the beadhead hares ear with the GO2 caddis. I continued working my way up the small stream over the remaining hour and a half and landed two more 9-10 inch browns on the GO2 caddis. The wind gusted at times making casting difficult. Finally at 5PM I’d reached a point where the stream narrowed and flowed through tighter vegetation, and I wasn’t sure how much longer Jane would fight the wind, so I returned to the car and called it a day. 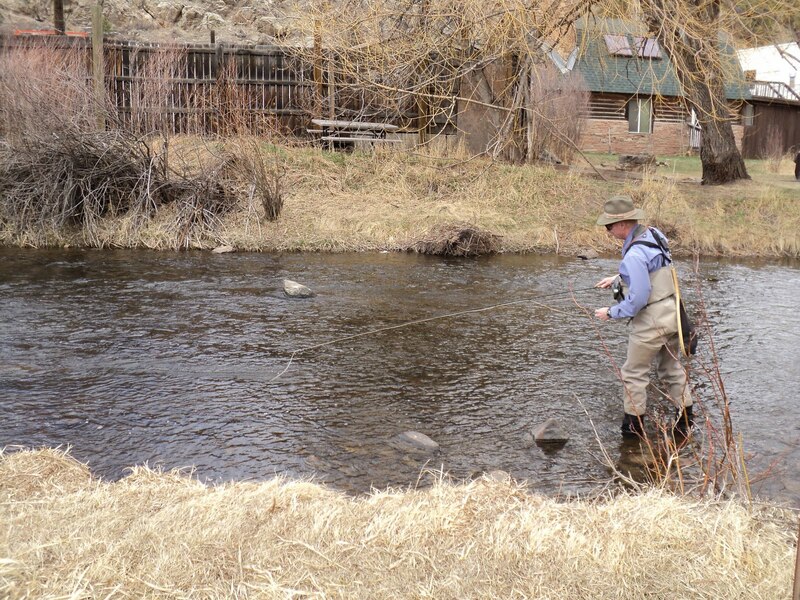 This entry was posted in Bear Creek, Fishing Reports by wellerfish. Bookmark the permalink.